Oregon Law offers a rigorous and comprehensive legal education with a curriculum that provides the fundamental intellectual and analytic skills for the practice of law, an introduction to advanced and frontier areas of law, knowledge of the persistent values of law and the legal system, and opportunities to develop hands-on legal skills. Special centers and programs provide additional resources for students and link the law school to the community at large in areas that include Business; Environmental and Natural Resources Law; Ocean and Coastal Law; Family, Child and Elder Law; Appropriate Dispute Resolution; Law and Entrepreneurship; and Public Interest-Public Service. 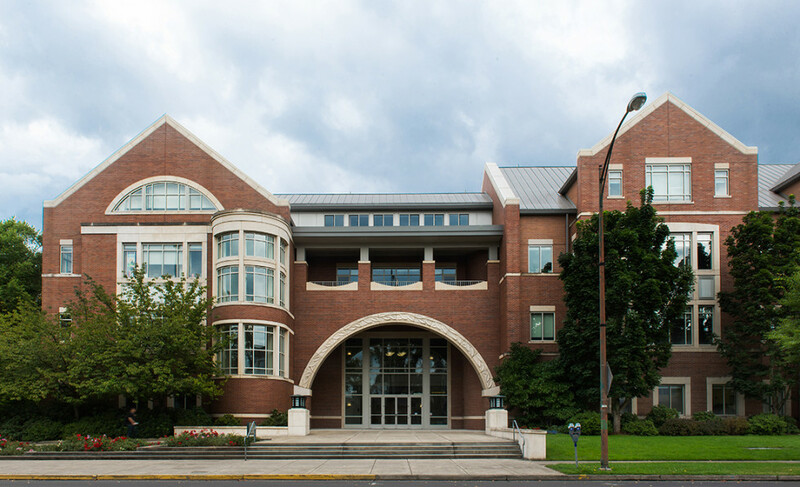 The Wayne Morse Center for Law and Politics is a university-wide center housed in the Law School that brings world-renowned scholars and activists to Oregon each year for interdisciplinary research, publication, teaching and public discussion of critical topics in the fields of law and politics. As the state’s only public law, the University of Oregon’s School of Law provides numerous opportunities for interdisciplinary learning that go beyond the traditional cur­riculum (such as intersections with journalism, conflict resolution, and environmental studies), and a robust commitment to public service and public interest law. The school's clinics and externship opportunities and “amazing” legal writing and research program round out the affordable and respected degree on offer here.Every faculty and staff member at Oregon is “extremely focused on the student experi­ence.” “You can always get ahold of your professor, and the Dean even holds office hours, allowing you to go and discuss whatever you'd like with him,” says a student. For com­mon occurrences like clinics, externships and registration, the “amazingly helpful” administration “has made everything flow very easily.” Conversely, if you have a special situation, “administrators are always available to meet and discuss solutions with you.” “The school is small enough that you really get to know the faculty and administration, and they will help you in any way they can to network and get jobs,” says a 2L (though some admit that the school “could use more career services related to jobs out of state”). The school’s major focus is on public interest law, but it has “a high number of specialized programs and great faculty that allow for students to get a great education in their area of interest,” and “is very supportive of students who want to pursue non-Big Law careers.”The classroom experience is “very collaborative,” and members of the “empowered student body” are supportive of one another all hours of the day. Students do worry that the University of Oregon (and law schools in general) are “not concerned enough about practical lawyering skills,” and wish that the administration could hurry along the pro­cess for creating even more clinics. “In order for the legal job market to weather this ongoing crisis, law schools must take swift measures to make law schools more afford­able, practical, and efficient,” says one. Top programs and centers such as the Appropriate Dispute Resolution Center, the Wayne Morse Center for Law and Politics, and the Center for Law and Entrepreneurship’s Small Business Clinic (which assists small and micro-businesses) help to offset this need and add to the school’s reputation.The law school has addressed these issues through offering 9 different clinical opportu­nities each year wither between 110 and 180 seats. There is also a robust externship pro­gram. Top programs and centers such as the Appropriate Dispute Resolution Center, the Wayne Morse Center for Law and Politics, and the Center for Law and Entrepreneurship’s Small Business Clinic (which assists small and microbusinesses) help to offset most other experiential complaints and add to the school’s reputation. Energy, Environment, And Natural Resources Law. Description: An advanced, professional study of the law, policies, and regulations governing the energy industry, environmental protection, natural resources and land use, and related topics. The University of Oregon School of Law offers concurrent degree programs enabling a student to earn a JD and a master's degree in approximately four years: JD/MBA Business & Law; JD/MA or JD/MS Environmental Studies; JD/MA International Studies; JD/MA or JD/MS Conflict & Dispute Resolution; JD/MA or JD/MS & Journalism; JD/MA or JD/MS in Community and Regional Planning; JD/MA or JD/MS in Public Administration; and a JD / MS in Water Sciences with Oregon State University. Alfred T. Goodwin - Former Chief Judge, US Ct. of Appeals, Ninth Cir. Want more info about University of Oregon School of Law? Get free advice from education experts and Noodle community members.